Comfort Keepers is a leading provider of Non-Medical, In-Home Care, with over 650 independently owned and operated offices nationwide and internationally. Our Comfort Keepers office is located in Bloomfield, CT and has been serving the Bloomfield and Manchester areas of Greater Hartford CT "East and West of the River" since 2003, providing companionship, homemaking, personal care, and transportation for seniors and adults in need of assistance with the activities of daily living. Comfort Keepers caregivers strive to build a positive relationship with their clients through interactive caregiving, helping to "keep" them in the "comfort" of their home. Comfort Keepers is registered with the CT Dept. of Consumer Protection as a Homemaker Companion Agency # HCA.0000.563, as is required of all businesses providing in-home care in Connecticut. Comfort Keepers is an employment model agency. 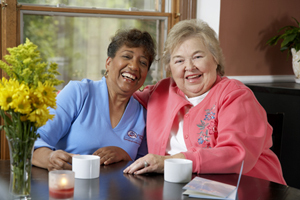 All of our caregivers are employees of Comfort Keepers and are residents of our local community. Each employee caregiver is bonded, insured, background checked, covered by Worker's Compensation and supervised by the Client Care Coordinator/Nurse. Comfort Keepers also verifies employee eligibility to work in the U.S. and coordinates payroll, with all applicable taxes paid. The Client Care Coordinator/Nurse participates in the assessment process and helps to develop the customized, written plan of care, supervises the caregivers and communicates with clients and families. Caregiver arrival and departure is tracked through a telephone time clock system. Comfort Keepers main office telephone 860-242-7739 is answered live 24/7/365 by our on call management staff. Greater Hartford, Bloomfield, Manchester, West Hartford, Windsor, Simsbury, Granby, East Granby, East Hartford, Glastonbury, South Windsor, Vernon, Wethersfield, Newington, Avon, Canton, and Farmington. Please contact our office at 860-242-7739 to schedule a home visit and client assessment or ask any questions you may have. We are available to meet with you to discuss Comfort Keepers solutions for In-Home Care - all with no obligation. Thank you for your interest in Comfort Keepers and we look forward to helping your family. We had a terrific experience with Comfort Keepers. My father underwent a full hip replacement and we hired CK to provide 24 hour care for him at his home. Maria and her staff were attentive, responsible and caring and we knew from the onset that my father would be in excellent hands. As adult daughters, my sister and I were comfortable and confident in his care during his rehabilitation in his home. His caretaker watched him with vigilance and patience and we are forever grateful for her care. I am happy to say that he is walking beautifully and we can hardly recall the hip that was replaced. I completely recommend Comfort Keepers.